Remodeling your kitchen will not only improve the look and function of your home, but you can also increase your home's value by upgrading the electrical circuits. Older homes were not wired for all of today's modern conveniences and technology. Many older kitchens have an electrical outlet here or there, and are missing GFCI outlets, which are to be used anywhere water is present in order to safeguard against electrical shock. If you are considering a kitchen remodel, or are already in the process of doing a remodel, include electrical wiring in your plans. You can bring your wiring up to code and make your time in the kitchen much more convenient! 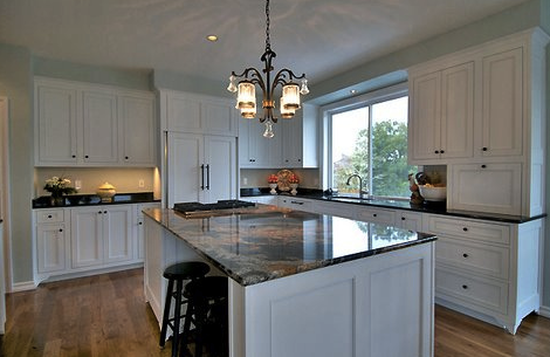 A kitchen requires at least 7 electrical circuits to properly handle the basic elements. Something to keep in mind is if an appliance has a motor, it should have its own electrical circuit. Depending on the total wattage of all the lights in the kitchen, a 15 amp, 120 volt circuit should power the ceiling light fixtures, recessed lights, and task lighting. Refrigerators have come a long way since the old iceboxes. Aside from built-in ice and water dispensers, there are smart refrigerators that will snap photos of what's inside and send them to your phone while you're out shopping, as well as refrigerators that allow you to order groceries from a touch screen on the door. Needless to say, your refrigerator needs its own dedicated 20 amp, 120 volt circuit, even if it doesn't have all the bells and whistles (and touch screens). A dedicated circuit for your oven range is also essential in a kitchen. The cooking area requires a 50 amp, 240 volt circuit to supply power to the range and oven. A special range outlet is also required. As microwaves have grown larger over the years, their wattage usage has increased as well. A microwave needs a dedicated 20 amp, 120 volt circuit wired with a ground. Often times, this circuit is shared with a gas stove outlet as long as they don't overload the total safe amperage. A garbage disposal should have a separate 15 amp, 120 volt circuit. Depending on local electrical codes, a garbage disposal may be able to share a circuit with the dishwasher. If you've decided to forgo washing dishes by hand, a dishwasher should have a 15 amp, 120 volt circuit. As mentioned above, it may be able to share the same circuit as the garbage disposal, depending on local codes. Small appliances, such as coffee pots, toasters, can openers, juicers, crock pots, and blenders, require at least two dedicated 20 amp, 120 volt circuits . The countertop outlets should not be placed further than four feet apart. There's a mile-long list of things to consider when remodeling your kitchen. The electrical wiring should be at the top of the list, not only for safety purposes, but for improving the convenience as well. Keep in mind that the electrical system should not be worked on by just anyone. Contact the professional Birmingham electricians Advanced Electrical Company to help create a plan for your dream kitchen's electrical wiring.